Although I voted Remain and would almost certainly vote against a Tory led Brexit, one of the things that has put me off the ‘People’s Vote’ campaign is the dishonest characterisation of Jeremy Corbyn as a poor leader because he is not leading a campaign to overturn a choice made by more than half the voters in the referendum and supported by about half of the people of theis country. The Labour position is to push for a Brexit that works and oppose a Brexit that is likely to be harmful as May’s deal is, or disasterous as a No Deal Brexit would be. If these options remain the only ones on offer then Corbyn and the Labour party are, as I understand it, obliged by Conference decision to oppose Brexit. The following was posted to FB and purports to be a motion moved and passed at the Labour Party Conference in summer. 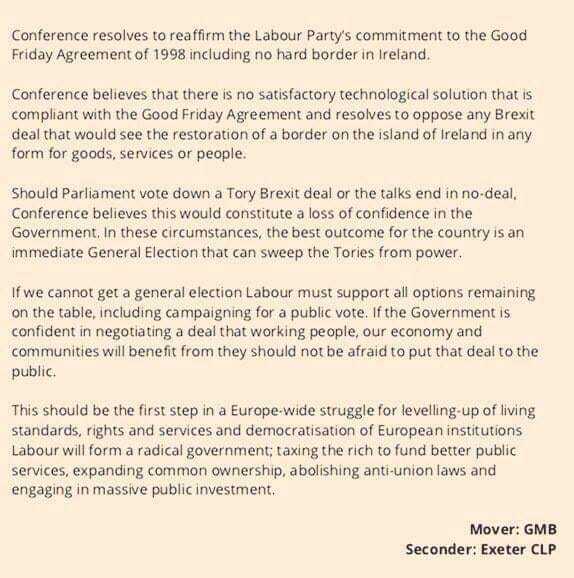 It’s badly written (no one can support ‘all options left on the table’ especially when they don’t know what those options are) but if this is the Labour Party conference position then JC has been faithful to it so far.